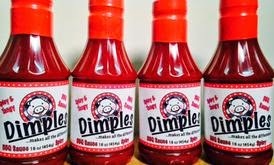 Dimples Original BBQ sauce was one of the very first products to receive a 5 Star review back in 2011. The sweet, tangy North Carolina sauce remains one of my favorites to this day. It's got nearly everything I'm looking for in a BBQ sauce: loads of natural sweetness, balanced savory spices and moderate vinegar tang. The only thing missing is a touch of heat. It's not easy to improve on a 5 star product, but Dimples has really outdone themselves. They've kept everything that's great about the original sauce and added another dimension to just the right degree. Many companies release spicy versions of their sauces. Unfortunately, what's great about the original product often gets overshadowed by the newly added heat. To their credit, Dimples has found the perfect balance. Like the original, Dimples Spicy is a medium/thin sauce. The spicy version seemed to be a bit darker red, but that may have just been my perception. I didn't actually have the two sauces side by side. Both are packaged in 16 oz. plastic bottles. Because of its consistency, Dimples is incredibly versatile. It's equally effective as a grilling glaze or dip. The flavor pairs perfectly with pork and chicken, but it's delicious on brisket and burgers as well. I also love it poured over any kind of fried potato (tots, fries, hash browns). Most importantly, Dimples Spicy was a key ingredient in the best pulled pork sandwich that I've ever created. To date, I've reviewed more than a hundred sauces. Dimples Spicy ranks among the very best. I've already contacted a close friend in North Carolina and requested that they bring plenty of Dimples Spicy with them on their next trip to Michigan. If you like sweet, tangy sauces and can stand a little bit of heat, Dimples has exactly what you're looking for. Check out the Dimples website to learn more about their products and order some of your own. 1 Response to "Dimples Spicy BBQ Sauce"
Very nice! Spicy version of a favorite! Cuddle your tongue with Dimples BBQ Sauce, a pleasant medley of sweet tomatoes and tangy vinegar.